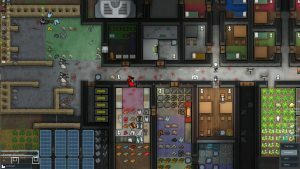 RimWorld is a 2D sci-fi colony sim game in which you manage people stranded on a foreign planet. Inspired by Dwarf Fortress and Firefly and developed by Ludeon Studios, this game’s been running for about 5 years, but only recently hit the official 1.0 stage. And let me tell you, those 5 years have brought many, many features that enrich the game’s story and options, something which would never have been done within a year. The benefits of such a long development are very clear in RimWorld. Whether it is the randomized worlds each time you load a new game, the different biomes that give unique buffs and debuffs to your characters, or the AI that you can pick to be chaotic, classic, or simply chill. There are many randomized events within this game that make it such fun to play and spend your time on. The gameplay and story go hand-in-hand, as both things depend on you, the player. You can be the benevolent god-slash-manager and gather as many people as you can and create your own cannibal army. You can create a peaceful trading civilization, or you can start a warmongering nation. All of this though, requires patience. The game may be slow. Full of options, the starting player can feel like there’s too much undiscovered as the tutorial teaches you the basics. But that’s where the beauty lies in RimWorld. Exploring the unknowns, whether its destiny, relationships between people, or the planet itself. You can pick three AIs to co-author your experience, if you want your story to be more laidback or more random and ruthless. Either way, you start with three passengers of a ship crash-landing on a planet. These accidental colonists aren’t professionals as you’ll soon find out, and some may be just farmers, nobles, scientists, or housewives. Each of them have their own strengths: farmers are good at labor, nobles are expert socialites, and scientists can research the new environment. All of them have opinions of the other, dislikes and likes, so they can marry, cheat, or even kill. The psychological aspect of this game is probably my favorite part, as I had to keep track on who got on with who, and who started fights. Sometimes, they simply didn’t want to work. Other times, they fell in love with the doctor that helped cure their sickness. Alongside that, many events happen around you. Snowstorms, dust storms, raids from the neighboring colony, mechas and ancient technology coming to kidnap one of your colonists or kill, a miracle package delivery of just the resource you needed, or just new people coming over to join you. 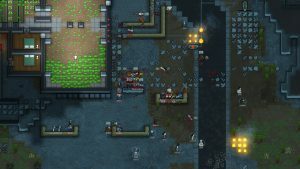 In RimWorld, anything can happen. You can buy this game for Windows, Mac OSX and Linux via Steam and directly from the game’s website. I greatly encourage everyone to go check out the Ludeon Studios dev blog on the creation of this rich game, see all the little bits and bobs the game has to offer. For more content like this, as well as more exclusive content and community interaction, subscribe to the Indie Pearls weekly newsletter or follow us on Facebook or Twitter!